Life is complicated. Cocktails don’t have to be. We love complex concoctions as much as any adventurous drinker, but some of the most enduring and appealing of drinks—from the Martini and the Manhattan to the Daiquiri and the Negroni—are those that are the most straightforward and simple. Simple cocktails, however, are in short supply on many of today’s increasingly complicated menus, which often feature drinks crafted with elaborate syrups and infusions, emboldened with boutique bitters and tinctures, or mixed with esoteric aperitifs and liqueurs. To celebrate simplicity, we approached four of the most creative bartenders around the country and tasked them with a mission: create an original and enduring cocktail with no more than four ingredients, using only spirits and mixers that may be found in any reasonably provisioned home bar (see the full list of permitted ingredients below). The drinks must be easy, creative and, of course, delicious, and as mixable in Muskogee or Sarasota as in Manhattan or San Francisco—no molecular mixology, no bespoke ingredients, and no complicated bells and whistles. How did they fare? Taste for yourself…. For the Patricia Anne cocktail, Lipsky took the formula for a fresh Gimlet and gave it a couple of flavorful tweaks: using honey (diluted with warm water, for ease of mixing) instead of sugar adds a depth of flavor and a silky texture to the drink, and Angostura bitters lend gravitas to the simple sour. Combine ingredients in a shaker and fill with ice cubes. Shake until chilled, about 10 seconds; fine-strain into a chilled coupe. A veteran of the San Francisco cocktail bastions Bourbon & Branch and Rickhouse, Erick Castro recently relocated to San Diego to open Polite Provisions, a bar that celebrates cocktail culture along with the classic soda fountain experience. Though accustomed to working in some of the country’s more adventurous bars, Castro says he’s an advocate of keeping drinks simple. 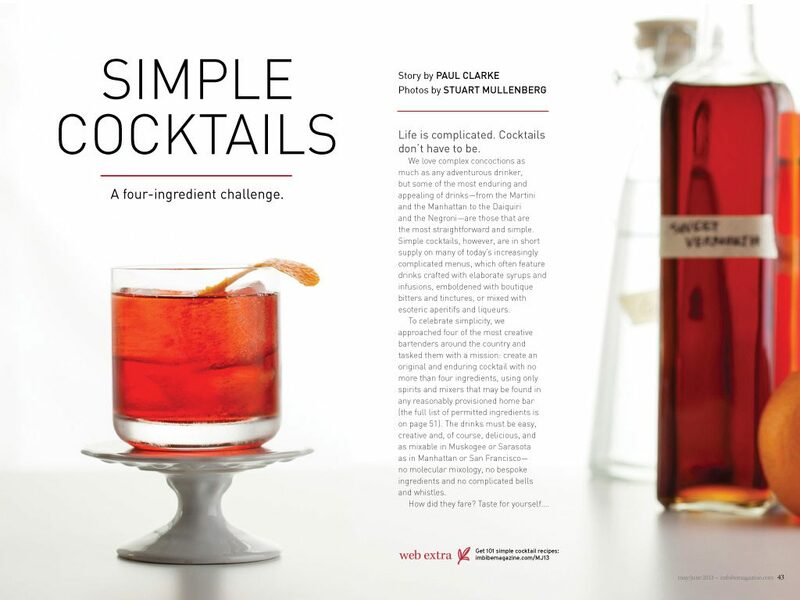 “I’m a believer that the more ingredients you add to a cocktail, the more likely it’ll be good, but the less likely it’ll be great,” he says, noting that complicated drinks are easier to craft than simple cocktails, as additional ingredients can cover up mistakes. 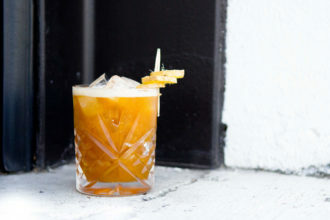 “You need to keep the drinks simple, where all the ingredients are allowed to shine,” he says. For the Django Reinhardt cocktail , Castro reached into the 19th-century bag of tricks, using aromatized wine as the base ingredient and modifying it with fresh fruit and sugar, like classic punches, sours and sangarees. Muddling the orange slices in the mix adds a trace of bitterness from the peel, which lends complexity to the drink without added ingredients. Place the orange slices in the shaker and gently mash with a muddler or wooden spoon. Add the remaining ingredients and fill with ice cubes; shake until chilled, about 10 seconds. Fine-strain into a rocks glass filled with fresh ice; garnish. Australian barman Naren Young is an increasingly familiar presence at craft bars across the country. Young is comfortable working with a mighty inventory of bespoke and boutique ingredients, making cocktails with as many as eight elements, and he admits that designing a simple, original drink can be daunting. “It’s often harder to think about what to leave out of a drink than what to put in,” he says. For the High Noon cocktail, he selected four ingredients that have a natural affinity for each other and mixed them into a bold-flavored combination. The peppery snap of blanco tequila is soothed by the sweetness of triple sec, while Campari gives the drink a brusque bitterness, and pink grapefruit brightens the mix. Combine ingredients in a shaker and fill with ice cubes; shake until chilled, about 10 seconds. Fine-strain into a chilled coupe; garnish. Unlike the drinks on the menu at Teardrop Lounge, Daniel Shoemaker’s mixological powerhouse in Portland, our list of permitted ingredients did not include small-batch cordials, fig-balsamic gastrique or caraway-black pepper shrub. But despite his tendencies to use such distinctive ingredients to create ambitious flavor combinations, Shoemaker was undeterred by our request for something simple. He selected Italian vermouth and orange liqueur for their sweet richness, and a blended scotch (Shoemaker recommends Famous Grouse) for smoky complexity; tonic water performs a double role as both bittering agent and brightener. It’s an unlikely combination, but Shoemaker specializes in unpredictable deliciousness. “The drink is easy, straightforward, and what I like to call eminently quaffable,” he says. Fill a rocks glass with ice cubes and add the first three ingredients; stir to combine. Add the tonic water and lightly stir again; garnish. Sean Hoard reconsiders Jägermeister with this delicious combo of Jäger, citrus, pear brandy and ginger syrup.